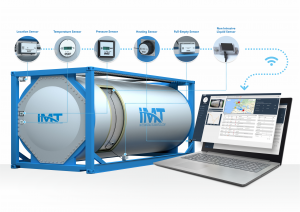 DD: IMT is an independent telematics solution partner for the tank container and tank wagon industry. We offer generic as well as tailor-made telematics hardware and software. Our clients are tank operators, tank manufacturers, tank leasing companies and end-customers. TCM: What is IMT’s background? DD: IMT was founded in 2013 in Breda (The Netherlands), between the ports of Antwerp and Rotterdam. This location enabled us to learn, test and improve our tank sensors in close cooperation with the industry. In 2016 we opened a satellite ofﬁce in Spain where 19 programmers are now working on the IMT software platform. Because installing telematics on a tank in 2013 was relatively novel, IMT had a precursor role, explaining the added value of telematics to the market. For years we were only delivering small quantity batches but that all changed in November 2016 when Hoyer committed to ﬁt all of their tank containers with IMT sensors, creating the ﬁrst ‘Smart Tank Fleet’ of the world. Hoyer was our ﬁrst client that did a full roll-out on strategic reasoning. I still admire the vision and ‘dare-to-act’ mentality of Hoyer. It is now positioning them many steps ahead of other tank container operators. Today all big tank container operators are customers of IMT. In a few years time we have grown from a 5 people company with EUR 300,000 of revenue and a big loss in 2014 to a company of almost 40 people, around EUR 10 million revenue and a healthy proﬁt.